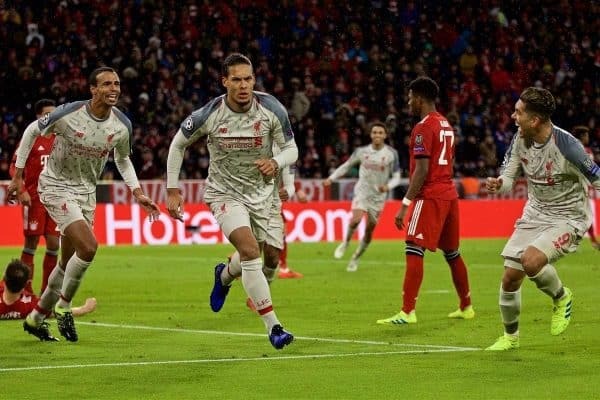 Liverpool advanced to the Champions League quarter-finals with a mightily impressive 3-1 victory against Bayern Munich at the Allianz Arena. Sadio Mane gave Liverpool a crucial away goal with a terrific chipped finish past Manuel Neuer in the first half to put Liverpool in control of the tie. A momentary lapse of concentration saw Bayern equalise via a Joel Matip own goal after Andy Robertson was caught out of position, but Virgil van Dijk rose to power Liverpool back in front with a thumping header from a corner in the second half. Mane then wrapped up the tie with his second of the game, heading past Neuer from Mohamed Salah‘s outside-of-the-boot cross to put the gloss on a historic night for Liverpool in Germany. – David Palmer on Facebook. Amazed Fabinho doesn't start. Been Liverpool's best midfielder for several months now. Why would you drop your best midfielder against Bayern. I don’t get it ????? – PeachesEnRegalia on the forums. That's an incredible goal from Sadio Mane. He's world class. He's got nine in his last 10 now. ? – Libero on the forums. That Mane's on fire! ??? Van Dijk a monster again. He will get a lot of credit and rightfully so but Matip superb defensively tonight too. Find me a better defender than Virgil Van Dijk. There is none currently ?? – James Martin on Facebook. Tonight typified Van Dijk’s influence since signing for Liverpool. Brilliant in stifling Lewandowski, provided the pin-point ball for Mané’s opener and towers above everyone for #LFC’s second. A top-draw night from the Dutchman. – Sir Bill Shankly on the forums. Apart from the unlucky own goal I think Matip has been absolutely superb! Brilliant cross Salah, Mane meets it. Liverpool have been strutting it and they have surely killed this tie now. Salah has been absolutely sensational in this second half. Topping it off with a fantastic assist. @LFC the outside the foot pass from Salah = Out of this world ?? Very silly from Andy Robertson that. We’d literally have been better off letting them score there rather than him taking a booking. Ridiculous from Robertson. Suspended for the first leg of the quarters. Robertson gets a needless yellow card and is now suspended for the first leg of the next CL round. Needless is the word. – Indian Scouser on the forums. If you don’t believe in this Liverpool team & manager after that, you never will. A brilliant performance and result for Liverpool. We were far too sloppy at times but rarely looked troubled despite that fact. A resilient performance which is a credit to the growth this team has undertaken under Klopp. Bayern Munich might be a fading force but that has to go down as one of Liverpool's best European away days. Only moments they were flustered was just before half-time. They were exceptional. – Kenny Oswin on Facebook. We deserve so much credit for how we’ve just gone there and made that look so easy. Seriously. Liverpool made that look pretty routine tonight. A consummate European away performance at one of the toughest places to go. – Not clinical on the forums. Six massive clubs in the #ChampionsLeague quarter-finals. We can win it this time.